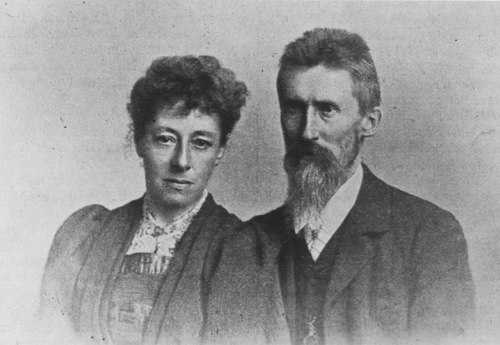 Of those, only the eventful opening act featured an orchestra and choir, though Gary was at the piano for an engagement in Estonia on July 29, when David Firman conducted the Haapsalu Symphony Orchestra and the Haapsalu Chamber Choir, a collaboration that drew an audience estimated at five thousand. 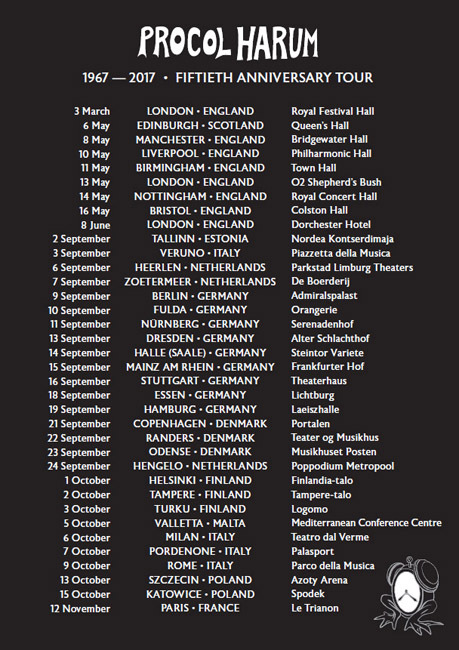 The tour schedule, mercifully, in hindsight, called for a two-month hiatus between the first and second concerts. By the time Gary and cohorts took to the stage at the Queen’s Hall in Edinburgh, on 6 May, the Commander had recovered from the tumble he took at the Royal Festival Hall and was by all accounts in top form. The Edinburgh show ended a forty-year absence north of the border, with at least one Scottish fan (that loyal BtP correspondent, Charlie Allison) bidding Procol Harum 'Haste ye back!'. In the month that followed, six English bookings included performances in London on two more occasions before a three-month lull saw them leave for the continent. 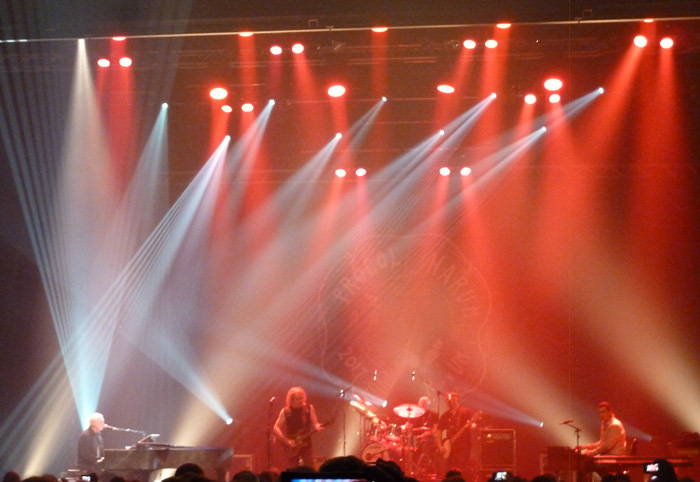 There they played a ten-week circuit of twenty-seven gigs, beginning in Tallinn on 2 September and closing in Paris on 12 November, the final thrust in a mega fiftieth-anniversary tour. I drooled over the itinerary. Alas, given prior commitments, there was only one feasible venue I could make: Berlin, 9 September, a Saturday, but a mere two days before start-of-term bedlam at Queen’s University. My colleagues in Canada, however, I reckoned would be none the wiser, not least because an ongoing research project made a visit to the Ibero-Amerikanisches Institut in Berlin mandatory. The stars lined up nicely. 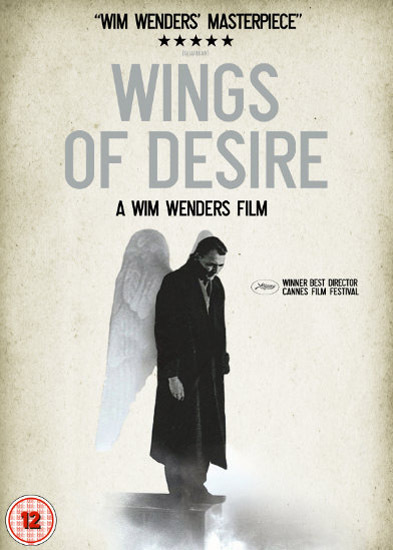 I'm in 'The Sky above Berlin' – literally what the Wim Wenders’ film, Wings of Desire in English, translates as. In the company of Angel Damiel (Bruno Ganz) I hover over the city as the 'plane circles until given clearance to land. At Tegel airport, I hop on a bus that takes me to Ernst-Reuter-Platz, where the U2 subway line runs six short stops to Mendelssohn-Bartholdy Park. I exit the station, cross a bridge, walk along a leafy embankment, and check in at Grimm’s Hotel, home base for the first part of my week-long stay, ideally located close to Potsdamer Platz and a stone’s throw from the Ibero-Amerikanisches Institut. The following morning I present my credentials, secure a reader’s card, and log up three days in a library that houses the largest collection of materials related to Latin America in all Europe. I then take the train to Leipzig, where I consult correspondence in the university’s Special Collections. Another three days at the Bibliotheca Albertina advances my quest to track how so much Latin American patrimony (stately pre-Columbian monuments and rare colonial-era manuscripts among the purloined) ended up in European repositories, far from those of the countries where they originated. 'Stealing them blind,' opines a line in As Strong as Samson, especially 'when you’re being held to ransom'. Keith Reid got that one right. 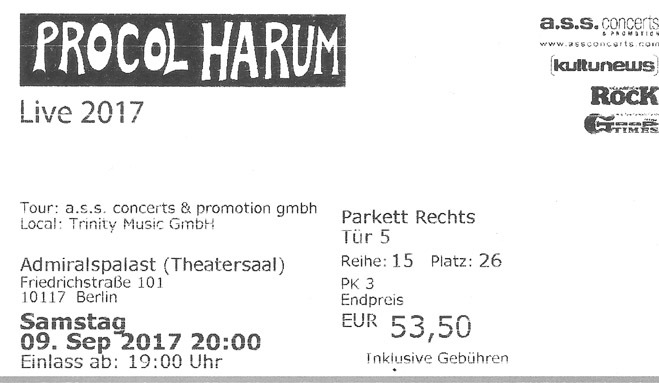 On my return to Berlin, I billet myself at the Hotel Leonardo on Bertolt-Brecht-Platz, a five-minute walk from the Admiralspalast on Friedrichstrasse, the venue for the Procol Harum concert. I have an evening to spare. 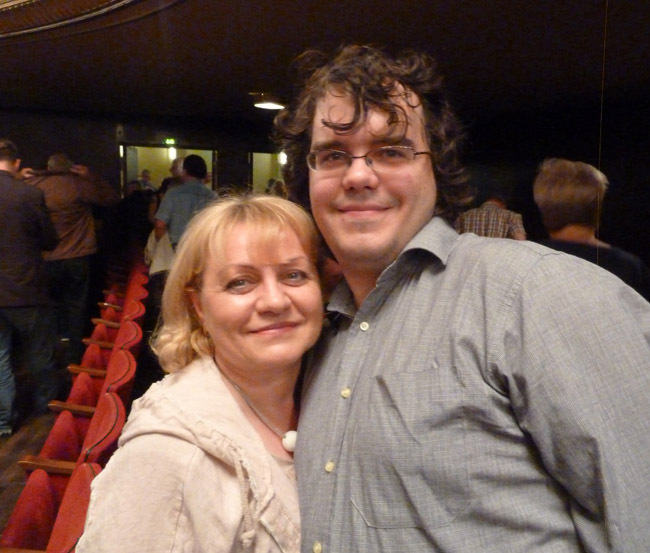 My mother’s love of musicals having rubbed off on me, last time in Berlin I got to hear Brecht’s Dreigroshenoper (Three-Penny Opera) performed at the Berliner Ensemble, a renowned repertory theatre only a block from the Hotel Leonardo. I have a little farther to walk to be treated to a superb production of Cabaret, staged in a magnificent marquee, the Tipi Am Kanzleramt, pitched on a park along the River Spree close to the Reichstag The seedy ambience of the Kit Kat Klub is as lovingly created as the songs of John Kander and Fred Ebb are by a talented five-man combo, whose members on occasion lay down their instruments to assume a brief role in the onstage drama. Their cameos call to mind a memorable one of Gary’s in Alan Parker’s film version of the stage musical, Evita. He sings the part of Juan Atilio Bramuglia, President Juan Domingo Perón’s Minister of Foreign Affairs, who opposed the charm offensive dubbed the 'Rainbow Tour' that the first lady of Argentina made to Europe in 1947. 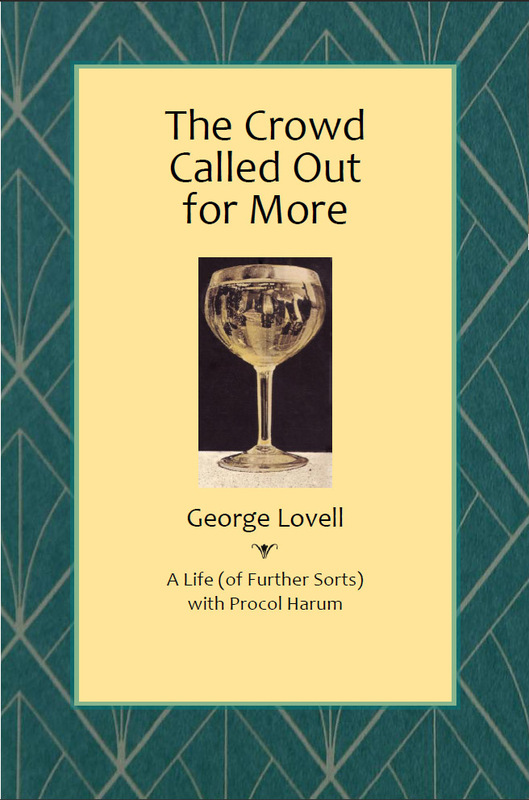 I wonder: could Gary’s compositions and Keith Reid’s lyrics lend themselves to a musical being made about the life and times, charmed or otherwise, of Procol Harum? Ray Davies adapted his oeuvre with The Kinks for the musical Sunny Afternoon, which I enjoyed immensely when it played at the Harold Pinter Theatre in London. Enacting Procol Harum, as did the Simple Sister dancers Benédicte Billiet and Jo Ann Endicott at Wuppertal – why not? Gary already has a Brooker ballet to his name, the little-known Delta. Choreographed by Laura Dean for sixteen dancers, it was performed on 20 December 1990 at the Royal Theatre, Copenhagen. There’s a distinct theatricality to many of the band’s albums and songs, fires which burn brightly. After the spell of fine, warm weather, the day of the concert is chilly and damp. The rain curtails my wanderings, puts paid to any extensive exploration of a city I have grown to like more and more. On a visit to a bookstore called Antiquariat Schwarz, whose owner, Peter Schwarz, has responded to an inquiry, I get hold of a title I’ve been on the look-out for, an account of the travels through Mexico and Guatemala in the late nineteenth century of Eduard and Caecilie Seler. The husband and wife team revelled in getting off the beaten track, and acquiring archaeological and cartographic treasures exhibited still with considerable fanfare in Berlin’s Ethnological Museum. I thank Peter for his services. 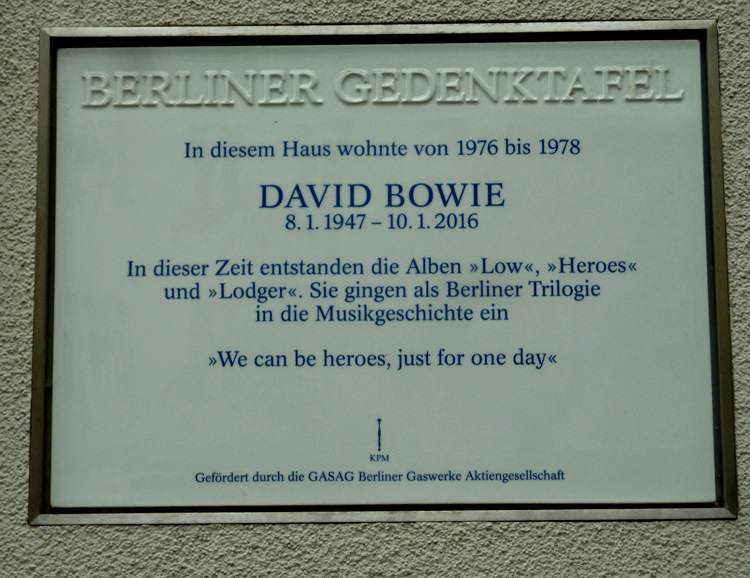 He tells me who used to live next door to his well-stocked bookstore on Hauptstrasse – David Bowie no less (see below) – and get back to the Hotel Leonardo in plenty of time to ready myself for the 'Heroes' I prefer to listen to (see below also). 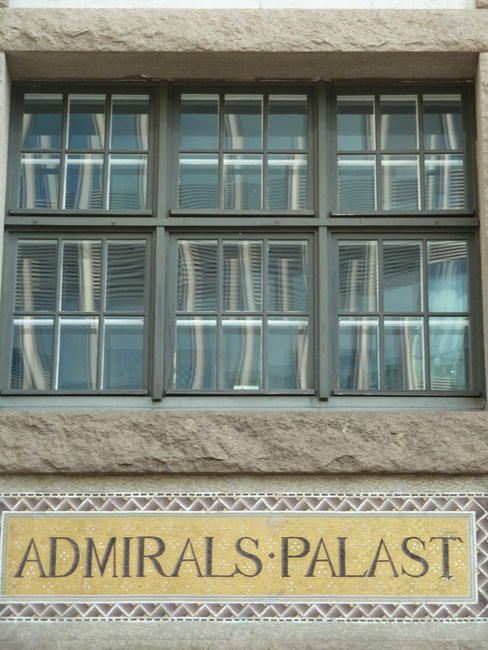 A blustery wind blows me over the bridge at Friedrichstrasse to the Admiralspalast. The dimensions and design of this sonic palace remind me of the now-demolished Green’s Playhouse in Glasgow, a victim of the fury of urban renewal after the one-and-only time I heard Robin Trower play as a band member of Procol Harum. Even an hour before show time, the courtyard entrance to the Theatersaal is packed – and so too its spacious foyer, fans swarming around the table where tour paraphernalia are spread out and selling fast. I stand in line patiently and buy a 'Unique Entertainment' badge (see above: a collector’s item, number 453 of 800) and a fiftieth-anniversary souvenir programme. Time on my hands before the music starts, I down a Warsteiner pils while dipping into the programme. 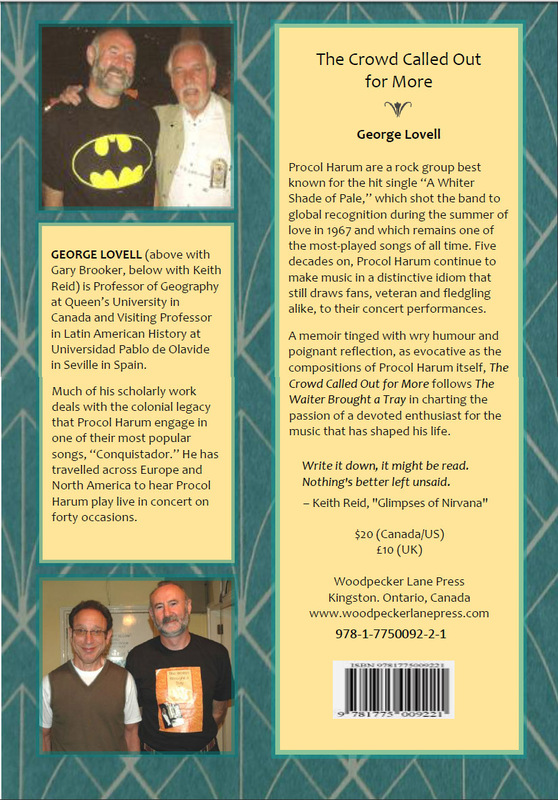 Written and edited by co-webmaster Roland Clare, it’s an incisive and insightful compendium that features jubilee reflections on Procol Harum’s musical legacy; profiles of (and Q and A dialogue with) current band members, a unit since October 2006; and a synopsis of the labours of 'Beyond the Pale', the rich and fruity website that’s the antithesis of boredom, informing us of all this and more, hebdomadally if no longer daily. 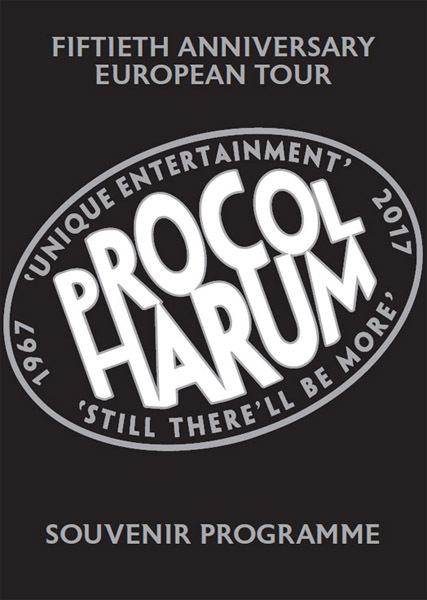 For me, perhaps the most noteworthy contribution – the historical geographer will out – is the time and place 'Procol Pedigree' crafted by Jonas Söderström, a family tree 'from the roots of the elder' that documents twenty-four permutations [in the Procol line-up] between the Summer of Love in 1967 to the band we are about to hear tonight. That tree, something magic it truly is, be not dead; from it, fate decrees, new life will spread. By a stroke of good fortune, the ticket I bought online ages ago (above) turns out to be right next to the sound monitor, aural central as of yore, the illuminated dials of its control panel manned by an audio crew of one, the strategic location guarded by a hefty bouncer. I’m quite far from the stage but have an expansive and unobstructed view. 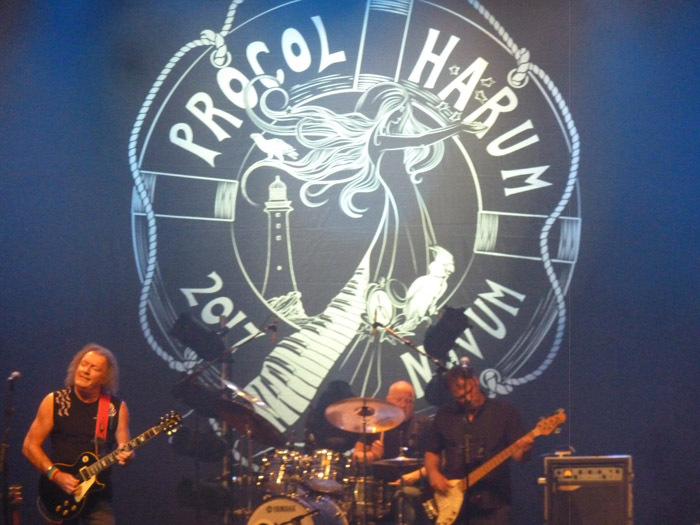 On stage a huge banner has been mounted as backdrop, the words PROCOL HARUM and 2017 NOVUM emblazoned around the rim of a lifebuoy. Icons from the sleeves of recordings made between the band’s first and thirteenth studio albums are represented: an alarm clock from Shine on Brightly (1968), a lighthouse from A Salty Dog (1969), and a cockatoo from the painting by Jakob Bogdani (1658–1724) that adorns Exotic Birds and Fruit (1974). A damsel in bliss swoons centrally, the creation of artist Julia Brown, commissioned by manager Chris Cooke to concoct a cover illustration for the new album (see below). I’m hoping tracks from it will momentarily be played. I am not to be disappointed. I sketched out a lot of things quite a long time ago. Time passed by and then we eventually got down to it. I Told on You seems now to be about Brexit and some of the stuff that’s happened because of that. But that was completely unintentional at the time. One of my prophetic songs, you know. Q: Do you think of Procol Harum’s music as being particularly British, or as celebrating British life? A: No, I don’t. 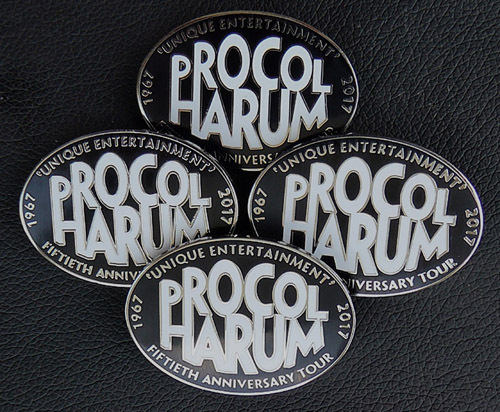 I’ve always thought that Procol Harum’s music was more European in some way. And make my name a mockery. Before the next offering, as Gary plugs the merchandise for sale in the emporium outside, Geoff interjects to observe, 'Och, it’s them two again,' a reference I take to mean he’s figured out that the pair of characters mouthing off from the floor is none other than the Tobermory Twosome, Gordon and John. Then comes a third cut from Novum, perhaps the best rendition of the evening. And then go home and make love to my wife. So when it’s time for my sunshine, can’t help wanting more and more. For me, Sunday Morning is the most Procol-sounding track on Novum. With Josh’s keyboard wizardry lending it orchestral colouring not audible on the album, Gary’s vigil is warmly received, his vocals as sublime as ever as he sings the prosaic psalm, a hymn to the ordinary man. Changing the mood completely, two verses of What Shall We Do with the Drunken Sailor are run through before up rises Whaling Stories, a tale of the sea delivered as if by God on high, and performed in synch with a spectacular light show (above). After it ends, Gary reminisces. 'Back in the 1970s we did a gig here in a sports field with the Bee Gees.' He pauses before he croons 'In the event of something happening to me,' the opening line of New York Mining Disaster, 1941. Let’s hope nothing like what happened in London in March. The up-tempo Businessman indicates that, while Messrs Brown and Reid word things differently, both see financial crises, the Wall Street Blues as it were, much the same: 'Everything’s a deal, although you know, it says you shouldn’t steal.' Without our greed, they couldn’t have done it. 'Ich bin ein Berliner.' Gary iterates the words made famous by President John F Kennedy five months before he was assassinated, then fills us in. 'I share the same birthday as JFK – a good man. At least we think he was – you never know these days.' Gut gesagt, Herr Brooker. And with a dedication to all those no longer with us, JFK among them, A Salty Dog secures us safe passage to a midway harbour. Another Warsteiner pils and further perusal of the fiftieth-anniversary programme take care of intermission time. As I settle in for the second half of the show, the stocky man sitting next to me gives me a nudge. 'Entschuldigen Sie, bitte – excuse me, but my wife and I are curious. May I ask you what you are doing, writing in that tiny booklet?' A woman peers around him, eyes inquisitive. 'I’m taking notes that I will later draw on to write up a concert report,' I say. With airs from Josh’s Montage 8 Synthesiser filling in for Christiane Legrand’s soprano voicings, Fires (Which Burnt Brightly) are lit perfectly, Geoff Dunn’s drumming stoking the flames. 'This next one owes something to Johnny Cash,' is how Gary introduces Last Chance Motel' his vocals complemented by Matt Pegg, and Geoff Whitehorn and Josh too. I left my heart at the Last Chance Motel. A stylish Homburg is put on, despite Gary declaring 'We don’t follow fashion.' From Novum come two fast-paced numbers in a row. 'I always think of Georgie Fame in this song,' Gary says of Image of the Beast,' after which the woes of being a Neighbour are shared. We move from the worries of home owning to the delights of that Grand Hotel where the good life still reigns, if only in nostalgic memory. 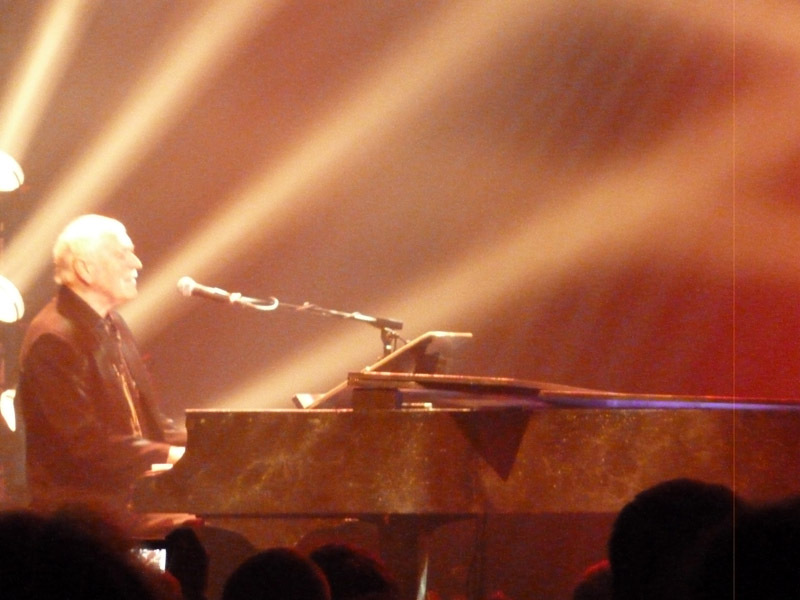 The veteran Conquistador jumps on his horse again, with The Only One making me think that Gary Brooker (see below) may very well be, and that the rockier thrusts of Novum are best heard live. But she smiled at me so sadly that my anger straightway died. 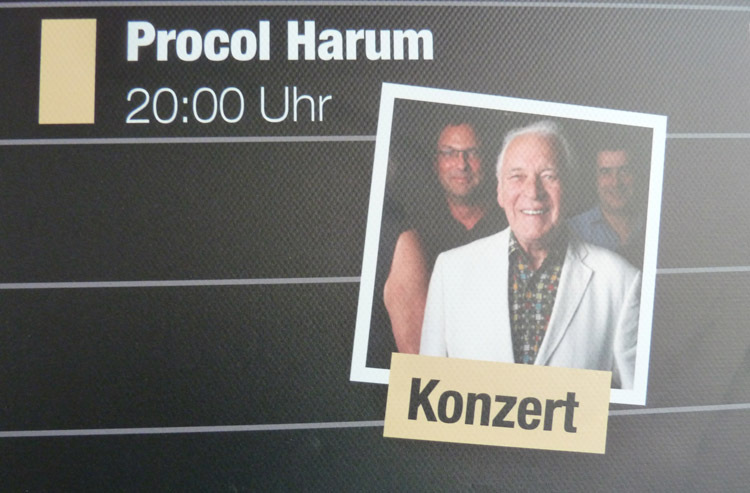 The crowd called out for more, but were not to be placated until the next time Procol Harum took to the stage in Fulda the next evening. Sadly, I was not there to hear them as I headed straightway across the Atlantic back to Canada.